Scannán as an gnáth é seo, ní hamháin mar gheall ar an Afra-thodhchaíochas (rud suimiúil ann féin), ach pléann Black Panther le fadhbanna an fíor-domhain – neamhchosúil le mórchuid scannáin maidir le sárlaoch. 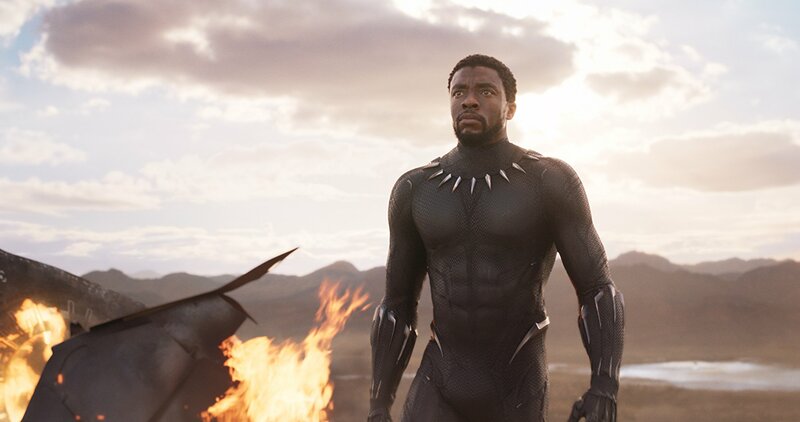 Mar aon le scannáin siamsaíochta eile, níl cruinneas stairiúil nó cultúrtha i gceist le Black Panther – cé is moite den teanga a chloistear go minic ann (Xhosa, fíor-theanga ón Afraic Theas), is domhain ficseanúil a thaispeántar ann: tír saibhir san Afraic dárb ainm Wakanda. Feictear “tír bhocht tríú-domhain” ón taobh amuigh, ach níl ann ach cur i gcéill – cónaíonn pobal Wakanda fé phlús, timpeallaithe ag spáslonga agus teicneolaíocht an todhchaí, i bhfolach ón domhain mór ar eagla go dtiocfaidh eachtrannaigh ar vibranium – miotal ficseanúil an-luachmhar nach bhfuil teacht air áit ar bith eile. Cé gur féidir a rá go bhfuil cultúr Wakanda bunaithe ar steiréitíopaí fé treibheanna na hAfraice – agus níl ganntanas cáinte arlíne mar gheall ar “leithghabháil cultúrtha” – ceapaim féin go bhfuil fiúntas ar an iarracht. Ní féidir a dhiúltú gur céim chun tosaigh é an bealach a thaispeántar Wakanda sa scannán so i dtreo cothromaíochta cultúrtha i Hollywood. Níl sé foirfe, ach ar a laghad níl na afra-charachtair in am an ghátair nó ag obair don tiarna geal sa scannán so, mar a dhéantar de ghnáth i go leor leor scannáin móra. Is iad atá i gceannas orthu féin agus is acusan atá an teicneolaíocht is déanaí ar féidir léi an domhan (agus na daoine geala “sean-nósacha”) a shábháil. Prionsa T’Challa (Chadwick Boseman) é príomh-charachtar an scannáin, agus é díreach i ndiaidh a athair a chailliúint in ionsaí lasmuigh de Wakanda. Anois filleann sé go dtí a thír dúchais chun an coróin a chaitheamh. Ní bheith aistear gan deacracht aige, áfach, agus a chol ceathrar réidh chun dúshlán a chur air maidir leis an gcoróin. D’fhás Killmonger aníos i Meiriceá Thuaidh agus creideann sé gur chóir do Wakanda deireadh a chur leis an éagothroime sóisialta ar fud an domhain, seachas fanacht I bhfolach ar mhaithe le síochán. Dá bharr, feictear go soiléir go bhfuil coimhlint cultúrtha (idir an prionsa áitiúil coimeádach agus an prionsa “eachtrannach”) léirithe sa scannán níos mó ná aon rud eile. San am céanna, gheofá a rá gur sárlaoch as an gnáth atá I gceist le Black Panther: ní bhfuair sé a chumhacht osnádúrtha trí thimpist, “bhuaigh” sé é agus bhí an duais tuillte aige. Anuas air sin, níl scéal an scannáin chomh simplí le “bagairt ar an ndomhan” mar a fheictear I go leor scannáin sárlaoich. In ainneoin sin, tá príomhcheist an scannáin níos casta: ní “conas an domhan a shábháil”, ach “an fiú an domhan a shábháil”. Ó thaobh ceisteanna sóisialta, is fiú a lua go bhfuil go leor postanna neamhghnách ag carachtair baininscneacha: tá gardaí Wakanda ar fad baininscneach, agus feictear banphrionsa Shuri (Letitia Wright) ag obair mar eolaí agus an saineolas aici fé na gléasanna is déanaí atá ar fáil in Wakanda. Sochaí cothrom go leor is ea Wakanda, ach ní chiallaíonn sé sin nach bhfuil dúshláin le sárú acu – go háirithe ó thaobh caidrimh leis an saol mór lasmuigh. Ar iomlán, scannán álainn is ea Black Panther (cé is moite de na droch-éifeachtaí físe anso is ansúd) a bhfuil go leor aicsin agus scéal suimiúil ann. Fiú mura dtaitníonn scannáin sárlaoich leat, is fiú féachaint ar an gceann so mar gheall ar an mbealach a úsáidtear samhlaíocht chun ceisteanna an lae inniu a phlé.